Bird watchers, conservationists and tourism promoters from all over the country and abroad are expected to flock to the Teodoro F. Valencia Circle in Rizal Park on December 7 and 8 for the 8th annual Philippine Bird Festival – Manila Bay, the country's largest celebration of avifaunal diversity and bird lore awareness. Themed Birdwatching. It's More Fun in the Philippines, this year's bird festival aims to promote the hobby as a nature tourism activity and drum up support for conservation and restoration of Metro Manila's remaining wetland in the Las Piñas-Parañaque Critical Habitat and Ecotourism Area (LPPCHEA), a 175 hectare protected habitat just off the Coastal Road leading to Cavite province. "There are 600 species of birds in the Philippines, no fewer than 200 are found nowhere else in the world," according to Michael Lu, president of the Wild Bird Club of the Philippines (WBCP), the country's leading bird watching society and chairperson of the Philippine Bird Festival. With its unique habitats across more than 7,100 islands, the Philippines has recently become a magnet for birdwatchers in the Asian region and further afield, Lu said. "The coastal wetlands and other green spaces around Manila Bay are part of the Asia-wide ecosystem and their conservation will have positive impact on Asian birdlife and the health and livability of Metro Manila," Lu explained. 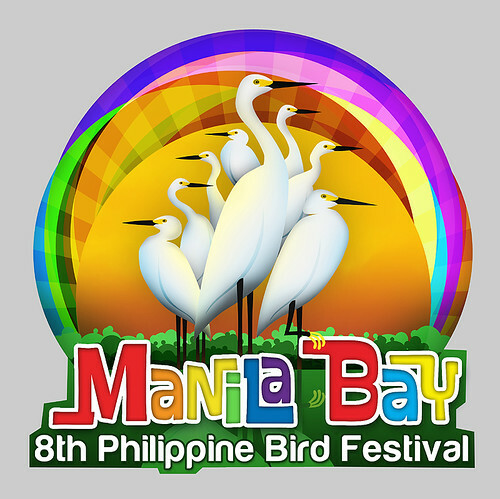 This year, the Philippine Bird Festival logo depicts the Little Egret, a common winter visitor species that makes its home along the Manila Bay coast. The festival will be held at the Teodoro F. Valencia Circle, Rizal Park and is open to the public free of charge. It will feature an exhibit of bird photos by the country's leading and amateur nature photographers, displays on the biodiversity of Manila Bay, films and lectures, bird watching trips, and forums on eco-tourism, birdlife management and aviation safety. Organizers said an activity center featuring bird-themed games and crafts will be on tap for the young and the young at heart. The Philippine Bird Festival was launched by local bird watching hobbyists in Quezon City in 2005 and in succeeding years brought the message of birdlife awareness and conservation to the country's important bird areas like Dumaguete City, Balanga City in Bataan, Puerto Princesa in Palawan, Cebu and Davao City. Delegates will head for Balanga City in Bataan on 6 December to participate in its Ibong Dayo (Migratory Bird) Festival at the Balanga Wetland Park, the first coastal wetland of Manila Bay to be declared an environmental protected area by the local government. Balanga's Ibong Dayo Festival, which started in 2010 a year after the city hosted the Philippine Bird Festival, has become an annual event for bird awareness and habitat conservation. This year's Philippine Bird Festival will be jointly-hosted by the Department of Environment and Natural Resources, the Department of Tourism, National Parks Development Committee, and the City of Manila. International organizations such as the Bird Conservation Society of Thailand, Chinese Wild Bird Federation (Taiwan), Wild Bird Society of Taipei, Malaysia Nature Society, Nature Society of Singapore, Chengdu Birdwatching Society (China), Borneo Bird Club (Malaysia), Asian Raptor Research and Conservation Network (Japan), University Birding Clubs of Korea, Taiwan Ecotourism Association, Sabah Tourism Board (Malaysia), Gujarat Tourism Opportunity (India), Thai Cycling Club will be participating in the festival, alongside local organizations and institutions including the Philippine Eagle Foundation (Davao), Katala Foundation (Palawan), WWF-Philippines, Isla Biodiversity Foundation (Babuyan), Haribon Foundation, Philippine Biodiversity Conservation Foundation (Negros Occidental), PENAGMANNAKI (Negros Oriental), Polillo Island Biodiversity Conservation Foundation, Birding Adventure Philippines, Mabuwaya Foundation (Isabela), Philippine Native Plants Conservation Society, Save Freedom Island Movement, Cavite Provincial Tourism and the Department of Tourism Region IX. Private institutions Team Energy Foundation, First Gen Corporation, Villar Foundation, Manila Water Company, Nuvali, Primer Group, Center for Outdoor Recreation and Expedition, City of Balanga, Province of Cavite, Genesis Transport and SMART Communications are also backing the two-day event. ibang bird lang tlga pumasok sa utak ko hahahaha .,.... at pag may festival n ganun mag iisponsor tlaga ako! Like the tagline of the festival "Birdwatching. It's More Fun in the Philppines"
It's my first time to get to know about a bird festival. I'm sure this will be a big event for bird enthusiasts. (Medyo that didn't sound right) Haha! Bird watching here in the Philippines is very interesting and even if I don't have any experience on this kind of event I want to watch it because seeing those birds are very relaxing. I am glad I visit this blog and found this interesting topic. Thanks.